These three characters will be in your party for the whole duration of the game. He is adopted by Leon's parents as a child and grows up with Leon and Maria as part of their family. They lose their parents when the imperial army of Palamecia attacks the kingdom of Fynn. 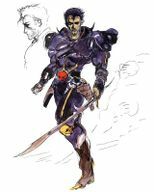 Firion decides to avenge their deaths by joining the rebel movement against the empire. Firion starts the game equipped with a sword and a shield. 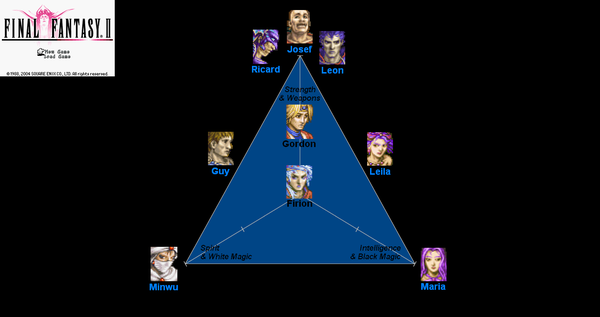 The final sword in Final Fantasy 2 can cast a black spell, but Maria is better suited for black magic: it's better to teach Firion a limited number of spells (four white and four black), and leave the rest to Maria and Guy, as outlined below here. She worries constantly about her brother Leon since he disappeared. Even so, she remains steadfast in her fight against the empire. Maria starts the game with the highest intelligence, the attribute that rules Black Magic proficiency; moreover, she starts equipped with a Bow, and the final bow in the game can cast a black spell. Therefore, she's suited to learn as many black spells as possible. He possesses enormous discipline and physical strength. Despite appearances, he is very gentle and occasionally naive. He is also capable of communicating with animals. 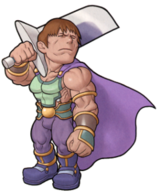 Guy starts the game equipped with an axe, and the final axe in Final Fantasy 2 can cast a white spell, therefore he should be taught as much White Magic as possible. Each one of these characters will be in the party only in the specified missions. He starts the game with 16 white spells and equipped with a staff. His great curative and protective abilities make for an easy game. A villager from the northern town of Salamand. He starts the game with no weapons and with some proficiency in karate (Japanese for "bare hands"), and it's good not to have to worry about buying equipment for one of your characters. 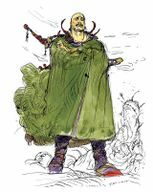 The exiled prince of Kashuan. He starts the game with low attributes and equipped with spear and shield. He will soon become very strong and fast. She starts the game equipped with a Thunder spell, a sword and a dagger. Her spell is effective against sea enemies. 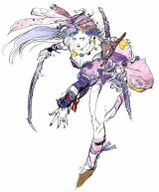 Leave the swords to Firion and equip her with daggers only, because she's the only character proficient in that weapon type. The last of the Dragoons. He starts the game with a spear and a shield, like Gordon, but with better attributes. Although his wisdom suggest he could use white magic, teaching him some black magic will allow him to get the best from his final weapon, the Thunder Spear. 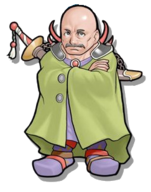 He is Maria's brother, and Firion's adopted brother and best friend. Leon loses his parents when the empire attacks Fynn. 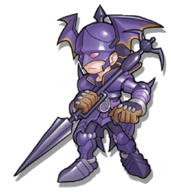 He escapes with Firion, Maria, and Guy, but imperial soldiers soon catch up to them and attack. He has been missing ever since. He's proficient with axes and swords, but at this point of the game you'll have some unused staves with magic properties, and you'll soon find a Holy Spear, too, so train him with these. This diagram summarizes the abilities of the characters, based on their starting attributes. Right: characters with offensive (black) magic. This page was last edited on 18 January 2019, at 17:48. This page has been accessed 30,364 times.